Warning! This class uses spellcasting which costs health instead of spell slots, and as such does not follow the rules of conventional spellcasting. Blood mages are usually people who has excessive pride and confidence in their abilities, so much so that they have resorted to using their own life's essence to cast spells. A blood mage usually recognizes that manipulating the essence of life can be a dangerous endeavor. 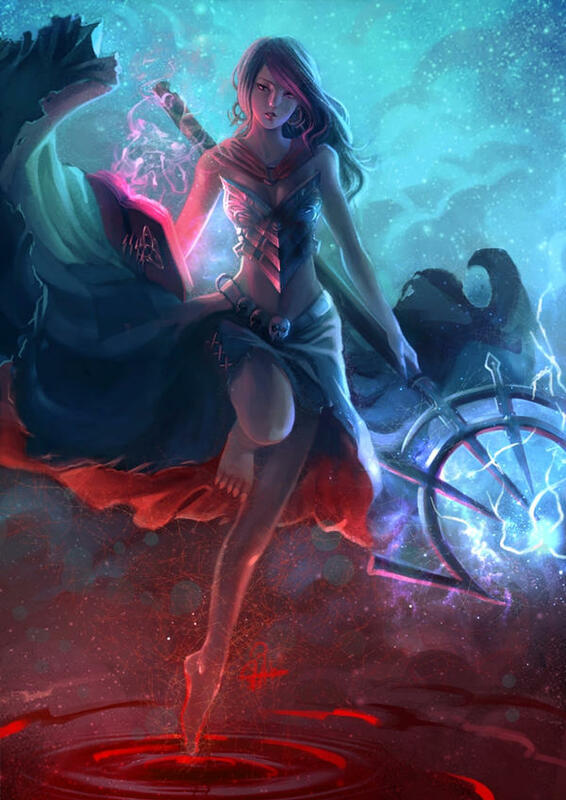 However, there have been numerous instances of blood mages both weak and powerful who have met demise thinking they could cast 1 more spell only for the spell to fail at an unfortunate time because they lacked the necessary sacrifice to cast the spell. No harm, no foul eh, well maybe a lot harm is needed for a spell to work. You can make a blood mage quickly by following these suggestions. First, Constitution should be your highest ability score, followed by Charisma then Dexterity. Second, choose the charlatan background. At 1st level, you know four cantrips of your choice from the Blood Mage Spell List. You learn additional blood mage cantrips of your choice at higher levels, as shown in the Cantrips Known column of the Blood Mage table. To cast one of these blood mage spells, you must lose a certain amount of hit points descripted below in spellcasting ability and here or you may use a spell slot gained through another class. When you damage yourself this way, you do not make a concentration check, and you go to 1 hit point when you cast a spell that has a higher hit point cost than your hit points and the spell fails. You are unable to cast spells that heal hit points through Blood Magic. You know four 1st-level spells of your choice from the Blood Mage Spell List, as shown at the bottom of the class. The Spells Known column of the Blood Mage table shows when you learn more blood mage spells of your choice from the Blood Mage Spell List. Each of these spells must be equal or lower than the Max Spell Level on the Blood Mage Table. For instance, when you reach 3rd level in this class, you can learn one new spell of 1st or 2nd level. Additionally, when you gain a level in this class, you can choose one of the blood mage spells you know and replace it with another spell from the Blood Mage Spell List, which also must be of a level equal or lower than the Max Spell Level on the Blood Mage Table. Charisma is your spellcasting ability for your blood mage spells, since the power of your magic relies on your ability to project your will into the world. You use your Charisma whenever a spell refers to your spellcasting ability. In addition, you use your Charisma modifier when setting the saving throw DC for a blood mage spell you cast and when making an attack roll with one. By 1st level, you have gained access to a pool of HP that may only be used to reduce the damage your spells deal to you. This pool is equal to (4 + your Constitution modifier(minimum 1)) x your blood mage level. You regain all of your Blood Buffer HP when you finish a long rest. By 3rd level, a blood mage's heartiness is starting to affect you. You have advantage on all Constitution saving throws from magic. By 5th level, you have figured out how to effectively heal allied creatures. As an action, you may touch a creature and give it temporary hit points equal to your blood mage level + your Constitution modifier(minimum 1) and you lose hit points equal to that amount. If you would go to below 1 hit point, you only lose enough hit points to make you go to 1, and the creature gains only the amount of hit points you had minus 1. You may use this feature a number of times equal to your Constitution modifier(minimum 1) and regain all uses of this feature once you finish a long rest. By 15th level, you are constantly flirting with death and have gotten used to it. You have become resistant to necrotic damage and are immune to necromancy spells. By 20th level, you have attained mastery over blood magic. You may reduce the cost of all 1st, 2nd, and 3rd level spells' HP cost by half before any of your class features that reduce the cost apply. A blood mage who can sap strength from others. By 2nd level, you know how to spend extra hit points to increase your damage. When you cast a spell, you may spend an amount of hit points equal to your Constitution modifier (minimum 1) to increase the damage a spell deals by 2 damage for each hit point used. By 6th level, you know how to siphon life from whatever any spell that hits a creature. When you cast a spell on a creature, you heal hit points equal to the spell slot level used on the spell, up to a maximum of once per spell. By 10th level, you can now drain the life essence out of a creature when it dies. When you kill a creature, you heal hit points (minimum 2) equal to double its CR. By 14th level, when you are magical healed, Spell Sap included, you are healed for 50% more hit points rounded up. By 18th level, you have learned how to directly pull life out of a creature, but not without risk. As an action, you can make a ranged spell attack against the creature within 60ft of you at any level. If it hits, you deal damage to the creature equal the hit point cost of the spell to the without losing any hit points. If you miss, you lose the hit point cost of the spell without doing anything. A blood mage who specializes in trying not to harm themselves. By 2nd level, your robust constitution is starting to show, your hit point maximum increases by 4, and it increases by 2 every time you gain a level in this class. By 6th level, you have gained an unnatural resilience to damage. When you finish a long rest, you may choose a damage type. You are considered resistant to that damage type until you finish another long rest. By 10th level, you have learned how to channel some of your blood magic into healing. If you are below half your maximum health, you may use a bonus action to use a hit die to heal yourself for the hit die + your Constitution modifier (minimum 1). By 14th level, you have learned how to make your spells hurt a little less. Whenever you cast a spell, it costs less hit points equal to your Constitution modifier (minimum 1). By 18th level, you have become extremely well built, your hit point maximum increases by 50 hit points. You learn certain spells that you cast through sacrificing your own vitality. Prerequisites. To qualify for multiclassing into the blood mage class, you must meet these prerequisites: Constitution 13 and Charisma 13. Proficiencies. When you multiclass into the blood mage class, you gain the following proficiencies: simple weapons.